Speed, acceleration and rapid change characterize our world, and as we design and construct buildings that are to last at least a few decades and sometimes even centuries, how can architecture continue to act as an important cultural signifier? Focusing on how an important nineteenth-century architect addressed the already shifting relation between architecture, time and history, this book offers insights on issues still relevant today-the struggle between imitation and innovation, the definition (or rejection) of aesthetic experience, the grounds of architectural judgment (who decides and how), or fundamentally, how to act (i.e. build) when there is no longer a single grand narrative but a plurality of possible histories. Six drawings provide the foundation of an itinerary through Charles Robert Cockerell’s conception of architecture, and into the depths of drawings and buildings. Born in England in 1788, Cockerell sketched as a Grand Tourist, he charted architectural history as Royal Academy Professor, he drew to build, to exhibit, to understand the past and to learn from it, publishing his last work in 1860, three years before his death. 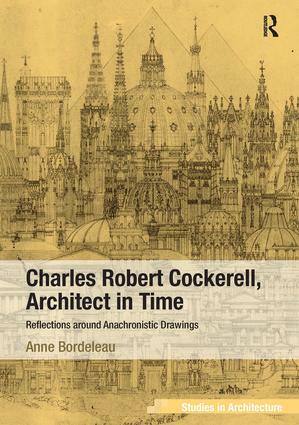 Under our scrutiny, his drawings become thresholds into the nineteenth century, windows into the architect’s conception of architecture and time, complex documents of past and projected constructions, great examples that reveal a kinetic approach to ornamentation, and the depth of architectural representation. Anne Bordeleau is Associate Professor at the University of Waterloo, Canada.